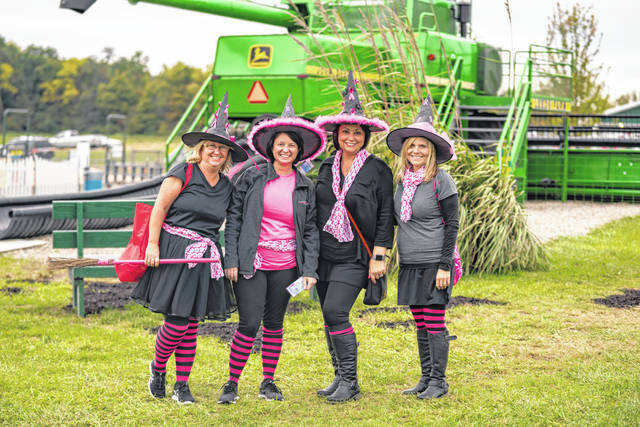 Pictured are some of the women who participated in the Pink Ribbon Girls’ Witches Night Out at Leeds Farm in Ostrander. Pink Ribbon Girls, a nonprofit organization providing direct services to breast and gynecological cancer patients and their families, is making a positive impact in Delaware County with the support of local organizations. Pink Ribbon Girls (PRG) began serving Central Ohio families in 2016 and are continuing to serve more and more families in the community. They provide free healthy meals, house cleaning, rides to treatment, and peer support to women and men battling breast cancer or gynecological cancers, regardless of income. In 2017, two Delaware County families were referred for services. Today, 10 percent of Central Ohio referrals are coming from Delaware County – an average of two families referred each month. This is all made possible through the support of local individuals and organizations who have stepped up to support PRG through donations and raising awareness of the services they provide. PRG lifts the burden from clients, ensuring that No One Travels This Road Alone…™. Witches Night Out is a popular annual event at Leeds Farm in Ostrander. This year’s event benefited PRG as a sea of 1,171 witches filled the farm on a brisk fall evening for bites, wine tastings, a silent auction and mischief. Leeds Farm presented Betsy Ralley, PRG regional director for Central Ohio, with a $42,422 donation. Christy Leeds, co-owner of Leeds Farm, said, “I’m personally thankful to be able to do my part to support breast cancer patients and their families during treatment.” Their gift will provide meals, housecleaning, and transportation for clients in Delaware and Union counties. Along with third-party events, local middle schools, high schools, and colleges have “Pink Games” in support of PRG where they add pink to their uniforms, the student sections wear pink, or the cheerleaders have pink pompoms. Ohio Wesleyan University held its Rumble for the Ribbon game on Oct. 6, which raised $1,700 for the Pink Ribbon Girls. For more information on Pink Ribbon Girls, how to get support, and how to support the organization through volunteering or donating, visit www.pinkribbongirls.org.